Queensland's colonial prison network was a three-tier system with the major prisons at the top, the Police Gaols in the middle (for sentences up to 30 days), and the local lockups being the smallest. These lockups were usually attached to police stations and used to hold prisoners overnight or a for a few days. There is often confusion in the records when distinguishing between these different levels of facilities, especially as individual buildings could be upgraded or downgraded according to fluctuations in the local population or changes in economic activity (such as short-term mining activity). A list of lockups can be viewed here. This is based on the report of the '1887 Inquiry into the Management of Gaols in Queensland'. Detailed information from the report regarding the size of cells, numbers of windows, sanitary facilities and condition of the lockups are omitted in this docemnet for the sake of brevity. The dates given in the report indicate the age of the existing lockups, and are not necessarily the dates when a lockup was first erected in that locality. The numbers of lockups would have increased in the following decades as more police stations opened. There were 222 police stations across the colony by 1895, and 272 by 1905. The 1880s were still relatively early days in the establishment of a British law and order system in the Bush and, as can be seen with certain places listed below, a lack of cells often resulted in prisoners being chained to trees. Old police cells, Laidley Pioneer Village. Some old lockup cells have survived and been relocated to various heritage centres. 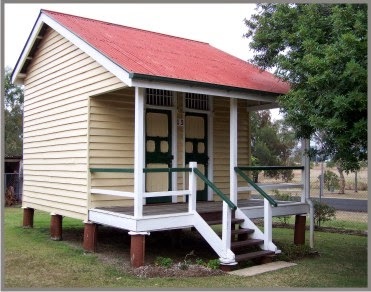 For example, the Australian Workers Heritage Centre at Barcaldine has the Toogoolawah watch house, the Beenleigh Historical Village has the Coomera lockup, the Laidley Pioneer Village has the Laidley lockup, and the Caboolture Historical Village has the old Caboolture lockup cells (now featured with the Queensland Prisons Museum). (The 'divisions' named in the list of lockups are police administration areas. There were numerous gaps in the information provided in the report and we have filled in further details where we could. If anybody has any more information (dates, etc.) to add, please contact the Boggo Road Gaol Historical Society). 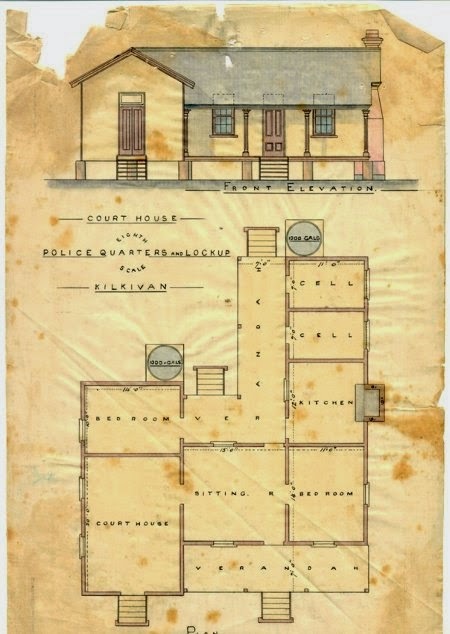 Police Station, Kilkivan, 1884 (Qld Police Museum). The two cells are part of the building.